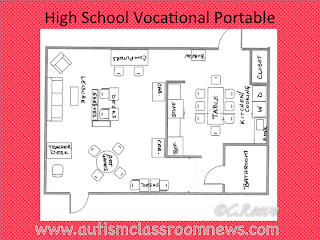 We had a request for ideas on setting up a middle school life skills / functional skills class. I jumped at the chance to talk about it for a couple of reasons. For one, I've set up a number of these classes over the years and have a number of ideas to share. And for another, working with students in need of functional life skills is an area near and dear to my heart. The challenge for me is not figuring out what to tell you, but figuring out what to leave out. 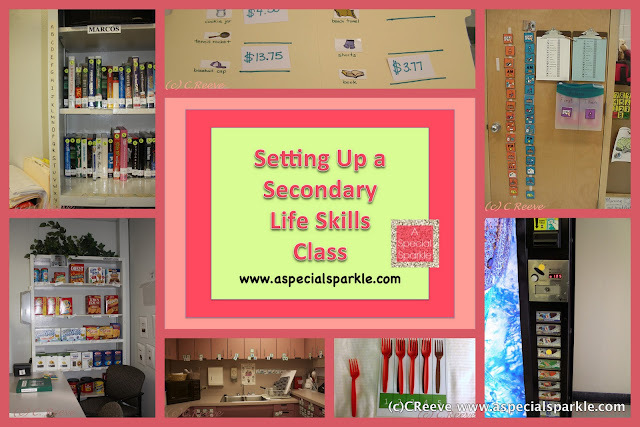 So, I thought I would give you an overview of the process I go through when setting up a classroom for secondary students who need a functional curriculum while referring you to some resources to help. The first step for me is getting to know the students who will be in the class. Everything about the class is going to be developed based on the needs of the students. Because of this, every year the classroom may look different--different schedule, different furniture, etc. To get to know the students, the team reviews the IEP and the educational records. I then find it helpful to develop a Comprehensive Autism Planning System--Teaching Plan for each student based on his or her IEP. 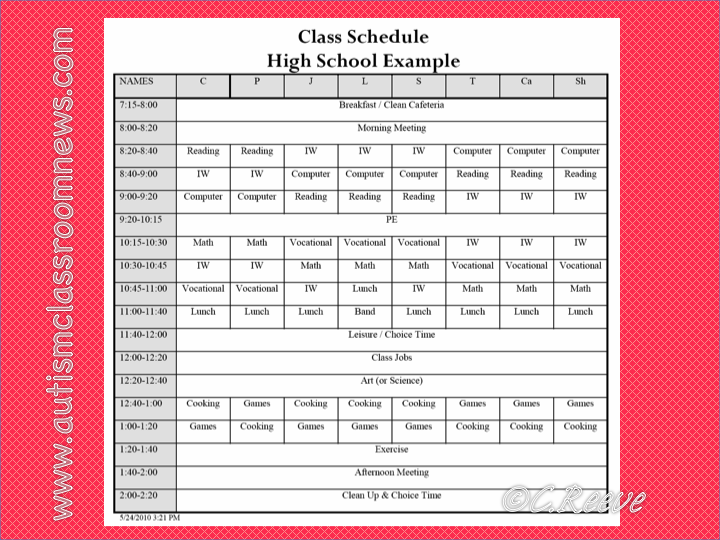 I find this format of the form to work best for classes where the schedule is based around the individual students (rather than a child's schedule that is based around the general education class's schedule). For more information on the CAPS and forms you can use check out this post. Also, don't let the word autism in the title of the form (or my blog) put you off. I use this system to set up classrooms of all types of students. Once I know who the students are and what their needs are, then the team can develop the schedule. To the left is a picture of a high school schedule we created for a self-contained classroom. The letters on the top row are where the names of the students would go. 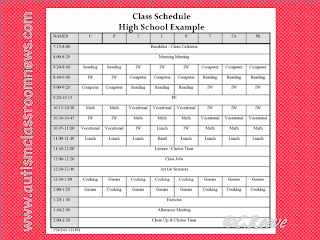 This form allows me to develop individual schedules while having the class come together as an actual class. Clearly the schedule has to be developed keeping in mind how many staff there are in the classroom and the physical space. However, for me, the length of time for the activities and the types of activities have to be based on the students' needs. Some classes can have a 30-minute calendar or morning meeting time, while others will only be able to manage a 10-minute group. Some will have most students leaving the room to go out to jobs while others won't have that. The types of activities on the schedule will give you an idea of what we work on in this type of class. 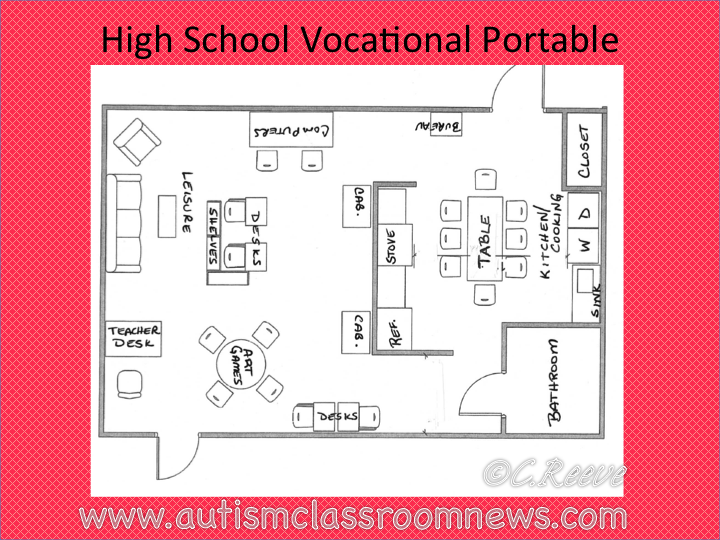 This class was set up in 2 portables so we had an academic portable and a life skills portable. We did academics and vocational skills in the morning and life skills and leisure skills in the afternoon. You can see the layout below. We had computers, an independent work center with structured work systems (IW), a time to work on reading and math, and a full group area. We also had a vocational center where we taught basic vocational skills that would carry over to jobs. These were also tasks that would carry over into the independent work systems as well as to job sites. 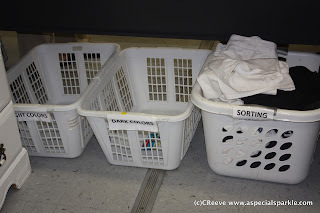 In the vocational / leisure portable we had laundry and a kitchen to work on cooking skills, cleaning and household chores, and laundry and putting away clean clothes. We also had a leisure area that allowed the students to play games, read magazines and work on computers for fun. Leisure skills and learning how to occupy their free time productively are very important to teach at this age. So, once you have the physical environment established and the schedule set up, you have to schedule your staff. We do that with what is known as a staff zoning plan (like a zone defense in basketball). It is simply a schedule that establishes who is working with what students in which activities. Having it in writing really helps the classroom to run on its own. This classroom had a teacher and 2 aides for 8 students so generally staff was working with either a group 2 or 3 depending on the group. I am planning to do a blog post about zoning plans at some point before school begins so stay tuned. 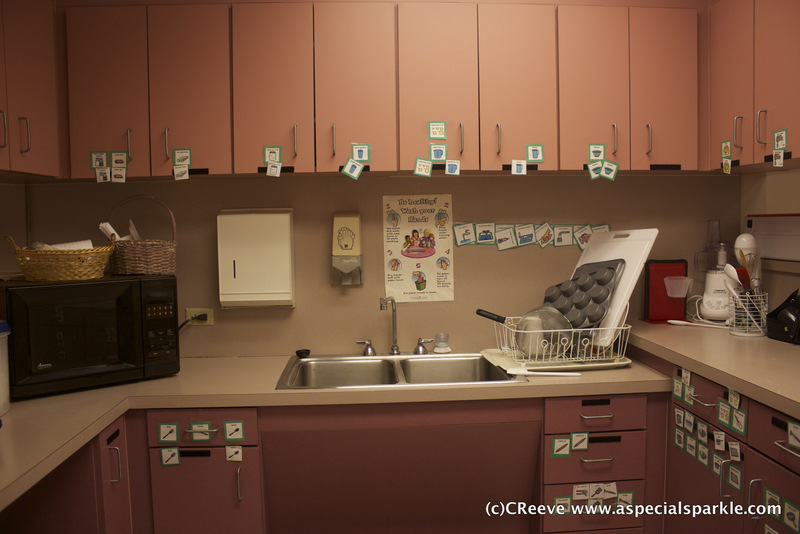 In addition to setting up the furniture we have to think about what types of visual supports the students will need. 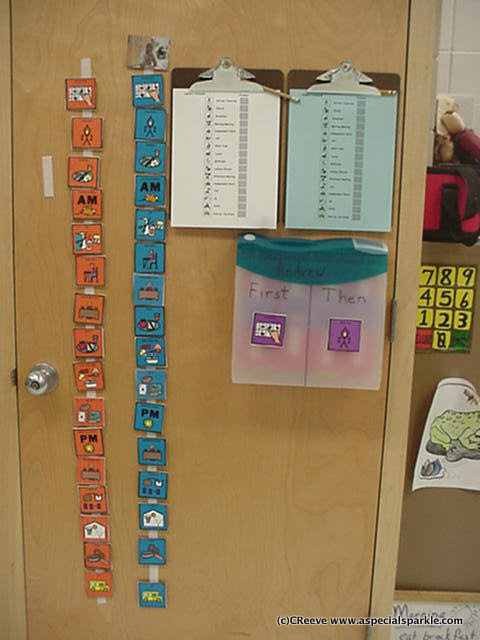 Usually we will have some type of visual schedule for each student. This set of schedules is for a middle school classroom. Some of the students could use a written schedule with small pictures, some needed a picture schedule they could manipulate and one student needed the schedule broken down into just first and then visuals because the whole day overwhelmed him. For ideas about schedules, see the series of posts I just completed, including one about using schedules for vocational and community-based instruction activities. 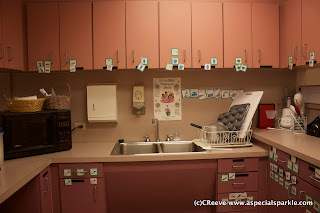 These two pictures are good examples of other types of visual supports we might use in a classroom like this. The kitchen has tons of visuals showing where things are kept to help in locating items in cooking as well as in putting them away. The dryer has a mini-schedule on it to help students do the laundry independently. And finally, in thinking about the classroom, the next step after setting up the physical environment and the schedules, we have to think about curriculum. It will really help to have a curriculum you can rely on in addition to the IEP. There aren't many good functional curricula out there at this time. However, the Unique Learning System has some great materials and is based on the common core with activities adapted for individuals whose developmental age is significantly lower than their chronological age. I love the fact that the visuals are already incorporated into the materials. You can read more about my thoughts on it and a guest blog post from a teacher who uses it regularly on my blog. Oh and right now you can download the summer unit for free to try it out! In creating the curriculum materials for the class, think about what skills students will need to use as they age out of school and how you can help them be independent. Below are some ideas of that. 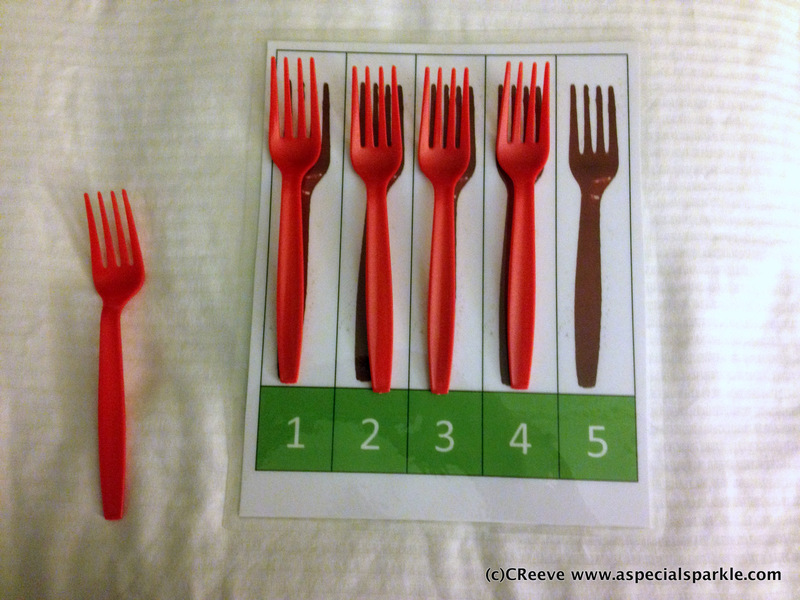 The forks were for a student in middle school who was still working on 1-1 correspondence, but we wanted the counting to be functional. 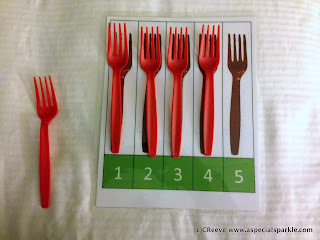 He still needed a number line or a jig for counting, so we developed a jig for forks, spoons, cups and plates that he could use for working on counting as well as use to set the table. He could set out 5 forks, count them, and then set the table with them. We made them by just taking pictures of the forks. 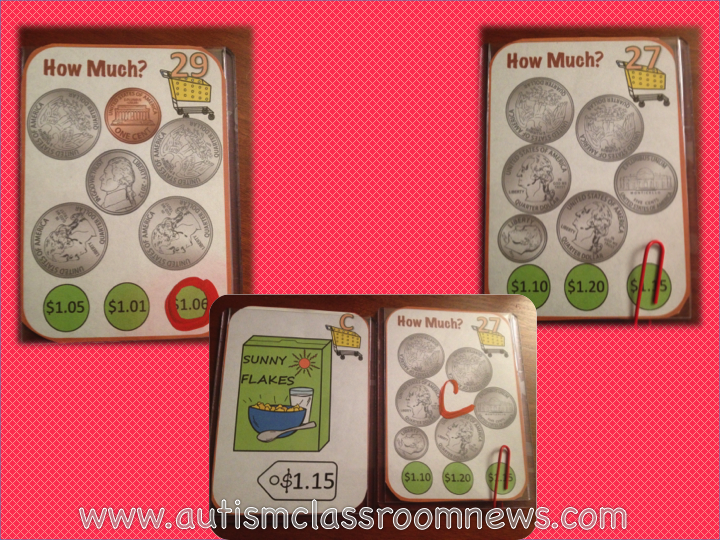 We did the same thing with coins for counting. This used age-appropriate materials to teach a skill that was typically taught to younger students. Sorting laundry is always a good functional skill and this fit well with into the laundry area of the classroom. 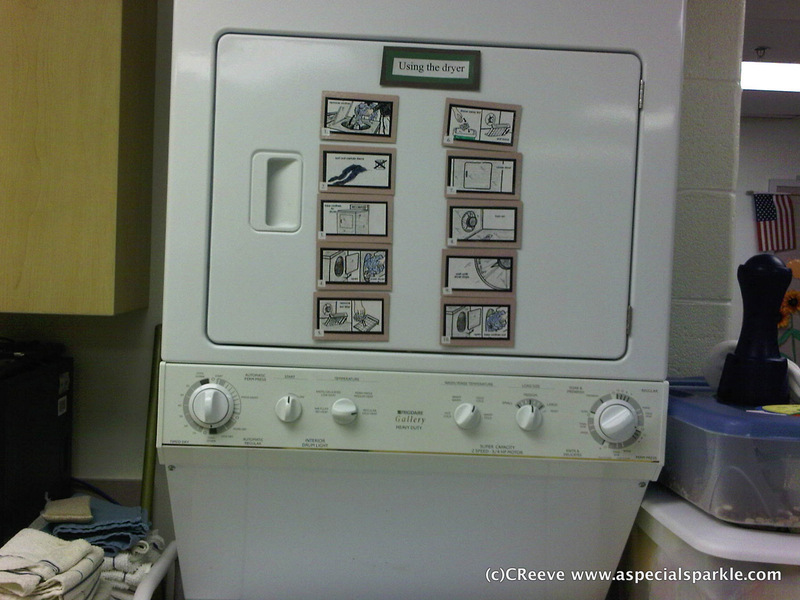 Some students might benefit from pictures on the laundry baskets, but others may not need them. 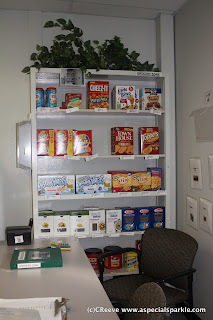 We have set up mock grocery stores in classrooms where we couldn't take the students out for community-based instruction as often as they needed to really master the skills. We saved empty boxes and cans that we would put prices on. The students would have a list and a budget and have to go to the store in the room or a neighboring room and shop. We often tie this in to cooking activities. 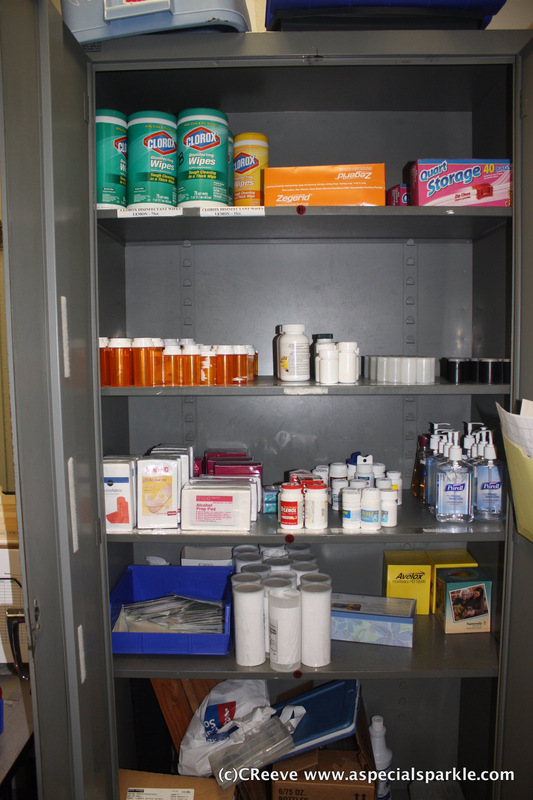 Below, a closet was designated in the classroom for students to take inventory and restock. 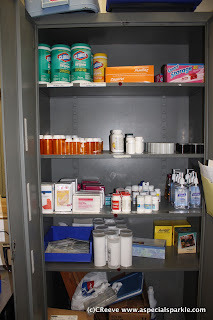 Some of the items were common classroom supplies while others were empty containers we saved and used. 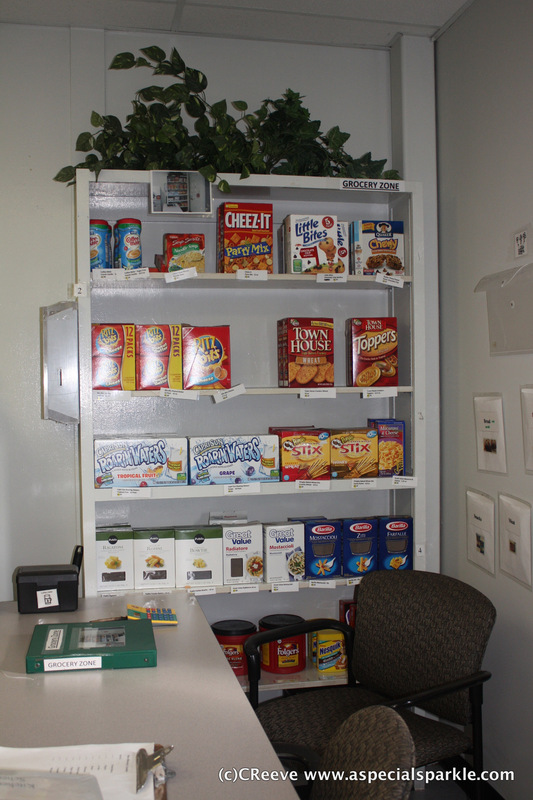 The students had a list of what they should have on each shelf and had to restock the shelves each day. The file folder is a good example of taking more academic tasks and making them functional. The student had to find the price of the items in a sales flyer. We changed out the items, moved them around and the flyer changed because this student would memorize the answers and just fill them in if we didn't. He always kept us on our toes that way! You can also check out my Pinterest boards below for secondary resources I have gathered. They are also collaborative if you would like to contribute to them. There are a number of ideas I've gathered from some great other bloggers in the world in the secondary special education there! 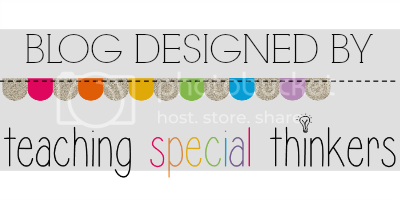 You can also check out my TPT store. 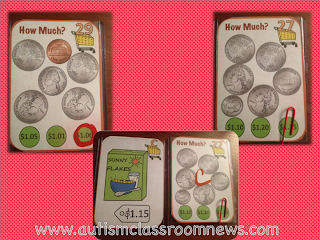 I've developed a number of materials for teaching money skills with a focus on the materials being appropriate for older students. The task cards below are tied into grocery items. 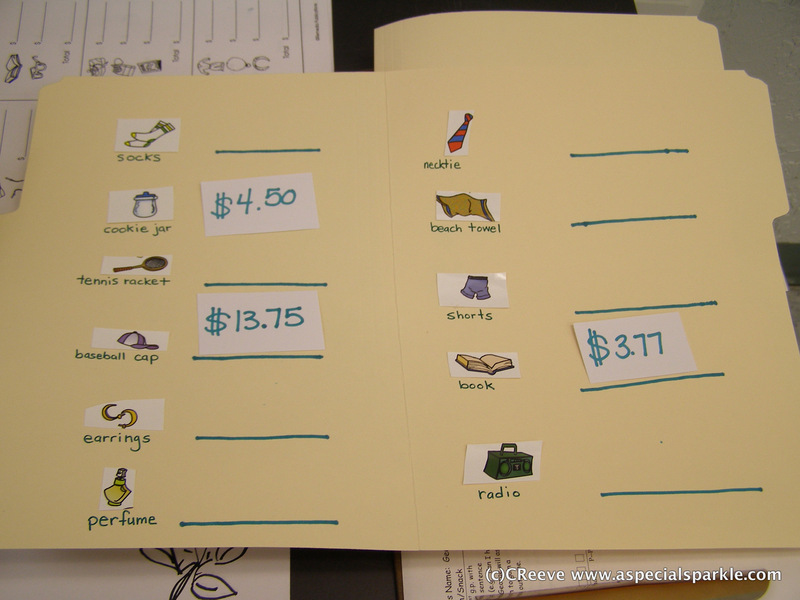 I also developed some tasks using the Next Dollar strategy for students who can't make change. you can read more about that strategy here and even download a FREEBIE in that post! 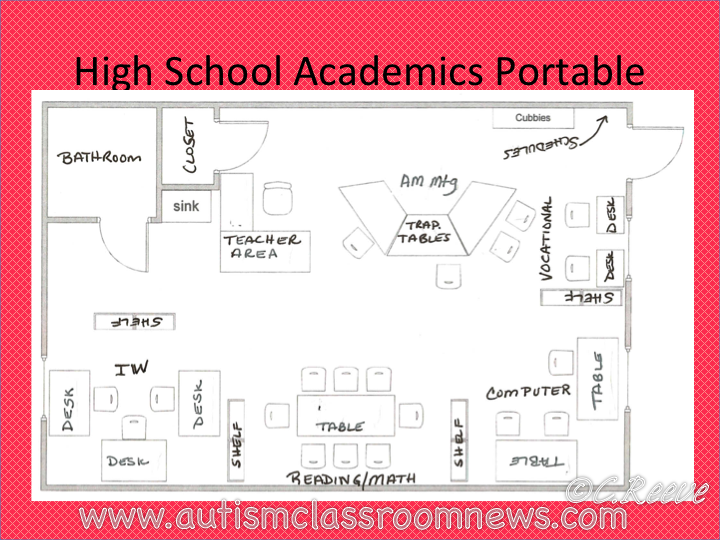 So, clearly there is much more that goes into creating this type of classroom, but this gives the beginnings of what I would think about. What strategies can you share that have worked for you? Thanks!